Venom, in my view, has been unfairly trashed by my fellow reviewers/critics. It is not the disaster many of them insist it is. In fact, many people in the audience seemed to love it, at least based on the number of times they burst out laughing. Then again, Venom did not, as far as I know, set out to be a comedy even if it did end up playing as almost a spoof of comic book-based films than a serious franchise starter. Crusading reporter Eddie Brock (Tom Hardy) has a beautiful fiancée, successful attorney Anne Weying (Michelle Williams) and a successful television show where he takes on the rich and powerful. At the top of his hit-list is Carlton Drake (Riz Ahmed), whom he has a disdain for, though I wasn't sure exactly what for. Brock's editor gives him the plumb assignment of doing a live interview Drake, the head of the Life Foundation, a group doing scientific research into curing cancers. Brock ambushed Drake on allegations of wrongdoing based on information Brock got from an email that he read, an email sent to and meant for Anne's eyes only but which Brock decided to read anyway. For some reason, Brock not only got fired but Anne dumps him after she herself is fired for his actions. If only Brock knew just how nefarious Drake is. His spaceships have brought back otherworldly beings he believes can give humans the ability to live in space by having them essentially share their bodies. Boy, when you write this down, it reads nuttier than it sounds. Anyway, Drake decides that these symbiotes should be tested on humans, so he has his goons round up the homeless of San Francisco. One of those includes Brock's friend, as he himself is on the skids. Little do they know that one of those symbiotes brought back from outer space is wreaking havoc in Malaysia and is headed towards San Fran. Brock, with the insider help of Dr. Skirth (Jenny Slate) breaks into the Life Foundation and while failing to save his friend does manage to get infected. Eventually, this being, who calls himself 'Venom', has joined with Brock. Venom gives Brock enormous physical strength and power, but it also makes him act irrationally and keeps a running dialogue with Brock. And it can also kill him slowly. Once Drake finds that Brock and his symbiote have joined so well, he is determined to get them both for his own nefarious plans. However, Drake himself gets infected and becomes 'Riot'. Riot wants to bring an invasion force of his fellow symbiotes to take over the world, and Venom, now finding that he likes it here where he won't be, in his words, "a loser" like he was in his own world, joins fellow loser Brock to save the world. Unbeknown to Anne or anyone else, Venom is still within Brock, only they seem to have come to an understanding about when and where 'Venom' will come out. We get a mid-credit scene where Brock goes to interview a mysterious figure in San Quentin (Woody Harrelson in a fright wig) who promises to unleash 'Carnage' and a post-credit scene where we see a scene from the upcoming Spider-Man: Into the Spider-Verse. Venom may end up getting a sequel, which I figure is the plan. Heaven Help Us All if they do make another one in the same vein as this one, for Venom is so unintentionally silly, haphazard and at times shockingly inept given the resources I figure it must have had. 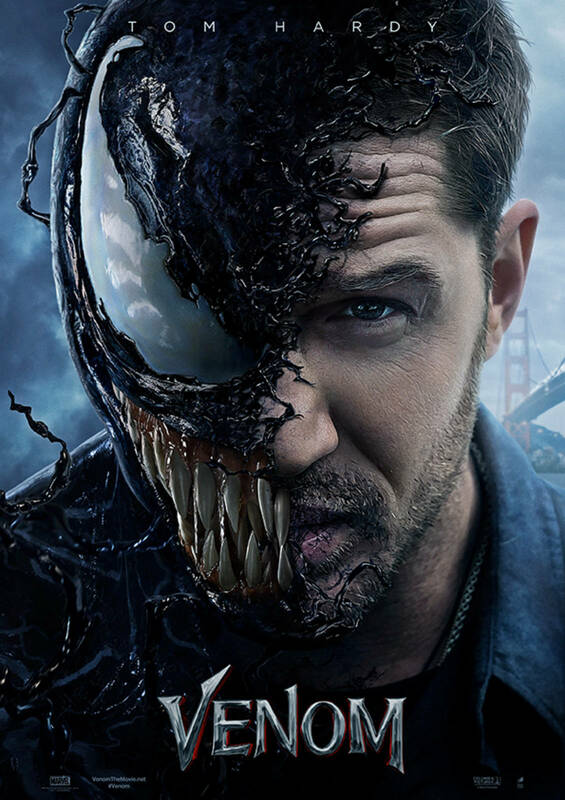 I think the major problem with Venom is tone, and that has nothing to do with its PG-13 ratings. As a side note, I think the decision to tone down the violent nature of Venom was done more to bring in kids than for any actual story reasons. That is a very odd decision given that many parents happily took their children to the very R-rated Deadpool and we still had some surprising moments of gore. At the center of the myriad of problems is Tom Hardy. Now, I confess to being one of the few people who has never been impressed with Hardy and who does not think he's one of our great actors. He strikes me as perpetually pissed-off about something, the time of man who would be in a bad mood if it was a sunny day. As such, Venom seems so wildly out-of-tune when it has Hardy try for some kind of romantic comedy acting. It does not help that Hardy sounds like The Waterboy's Bobby Boucher. It seems almost laughable that someone so muscular could be so bumbling and timid. Many moments where Hardy and company are asked to play things serious or menacing just made the audience break out into laughter. The lowest point is when Brock looks in a mirror and catches a quick glimpse of Venom. He lets out a Homer Simpson-like scream and crashes into the bathtub. Not that him being frenetic and jumping into a lobster tank didn't make things already unintentionally hilarious. There is a lot in Venom that will make one start laughing when you are not supposed to. There's the aforementioned Hardy-As-Adam Sandler act. There's the oddball running dialogue between Venom and Brock that almost comes straight out of the Steve Martin/Lily Tomlin film All of Me. There is the Malaysian zombie-types that look like an impersonation of Men in Black's Vincent D'Onofrio. 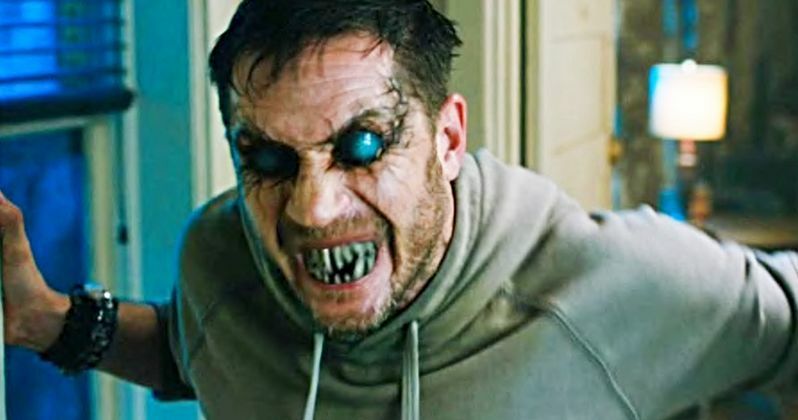 You can imagine that Hardy, growly and muscular as he is, would be a perfect Venom. He would be if he were playing Venom, but for most of Venom he plays this slightly bumbling semi-comic character more suited for a romantic comedy than an action film with an monstrous antihero. Not all the blame can fall to Hardy though. He's saddled with some awful dialogue that sounds as if it were written by teenage boys than actual adults. At one point, Venom is offering Eddie Brock romantic advise on how to deal with Anne. At another point, he refers to both of them as 'losers' and when Brock takes the elevator rather than jump out the window, 'Venom' shouts "PU**Y!" Funny moments in an action film is one thing. Being almost idiotic to get them is another. Williams is one of our finest actresses, so she either was slumming it in Venom or just decided she needed to take a rest while getting a check because she was simply not engaged in the proceedings. Ahmed was almost too calm, his motives muddled and his character too contradictory to be believable. On one hand, he is very nice with children and on the other he's casually killing people. Apart from all the performances which were pretty bad (though in fairness the script gave them very little to work with), the effects were shockingly bad. At more points than I care to remember it looked that Hardy was in front of a green-screen more reminiscent of films from the 1940s than those with computer generated imagery. The actions scenes themselves were also confused and jumbled, making things hard to follow as to who was who and where things were going. Venom is not a disaster if by disaster you mean a film that you will loath. I did not loath Venom only because I found you cannot help laughing at how so much went wildly wrong. Curiously, Spidey is the one who saves Venom in the form of the beautiful scene from Spider-Man: Into the Spider-Verse at the end.